The ailing Oregon Historical Society wants to make a fresh start. Will anyone notice? INSIDE THE BABY-BLUE warehouse in a dreary suburban Portland industrial zone, the ambience is dark, quiet, and chilly as a tomb. But George Vogt, 66, the soft-spoken, bespectacled, soon-departing director of the Oregon Historical Society, looks like a book-rich man at home in his library, strolling through the two climate-controlled acres of shelves, drawers, and crates, stopping every few steps among the hundreds of thousands of manuscripts, maps, papers, and artifacts. With genuine enthusiasm checked against an academic’s fear of overstatement, he singles out for our consideration a priceless Native American basket woven so tightly it can hold water, the box office from the 1911 Fox Theatre, a ’40s-era tuna canning machine, a grim-looking horse-drawn hearse, and a gym-sized architectural model of the Banfield Expressway (now Interstate 84). “And can you guess what this is?” Vogt asks with an expectant twinkle in his eye, stopping in front of a 10-foot-tall mint-green wall of colored buttons and lights that—except for the fact that it’s solid steel—resembles a prop pilfered from a 1950s science fiction movie set. “It’s a control panel from Trojan,” he says, referring to Oregon’s only nuclear power plant, which was decommissioned in 1993 and demolished in 2006. This is the Oregon Historical Society’s secret storage warehouse, or what Vogt prefers to call the “Oregon Vault.” More than 90 percent of the institution’s holdings are stored here—some 85,000 artifacts, 3 million photographs, 25,000 maps, and countless manuscripts and films, each cataloged, labeled, and neatly arranged by a staff that once numbered over 100 but has dwindled to 34. 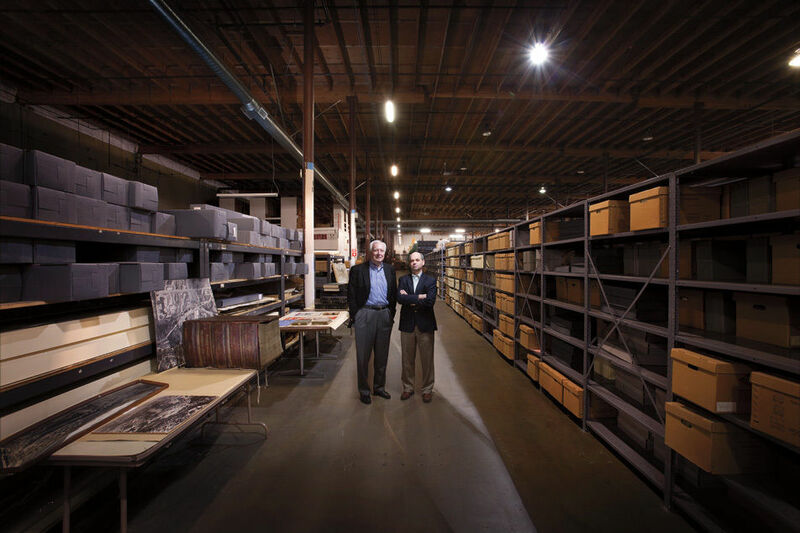 Vogt jokes that the 100,000-square-foot storage facility resembles the warehouse at the end of Raiders of the Lost Ark—priceless historical treasures stacked in endless, identical rows of wooden crates. The comparison may be more apt than he intends: After more than 20 years of public ambivalence, failed leadership, and a steady loss of intellectual brainpower, few of these artifacts have ever seen the light of day—other than the occasional appearance in an OPB documentary or the notes of a lone researcher. And unless the institution’s fortunes change fast, they may stay hidden forever. OHS, the only private state historical society in the West, boasts one of the largest libraries and archives on the Pacific Coast yet has not had a staff exhibit curator since 1998. It is no longer actively seeking new materials. (The last collections curator departed in 2004.) The most recent major exhibit to pass through its doors left in 2003. Last August, a team from the American Association of Museums deferred reaccreditation until the society develops a new strategic plan, noting that “the museum appears to be in survival mode.” Indeed, when Multnomah County voters threw the institution a $10 million lifeline in November, the society was at the verge of turning off the lights for good. This month, one of the state’s most connected political operatives, Kerry Tymchuck, replaces Vogt as interim executive director, backed by a new board president, Jerry Hudson, known for his turnaround of a financially ailing Willamette University during the 1980s. But even with new money and leadership, OHS faces a much more profound question than whether it can merely survive: can the society find an audience? 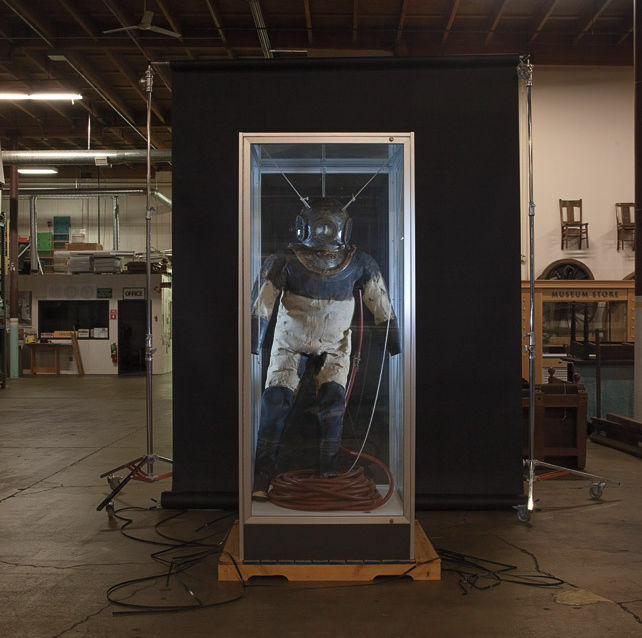 An antique diving suit at the Oregon Historical Society. ON A BITING January night, two hundred people have crammed into the Kennedy School theater on NE 33rd Avenue, sipping wine and IPA. As slides of vibrantly colored murals blink on the big screen, a trio of sexagenarian artists—Jenny Harada Allen, Henry Frison, and Chonitia Henderson Smith—tell how, in the winter of 1977 and 1978, they created 20-by-20-foot paintings on buildings only a few blocks away, depicting moments in local and national African American history, from the earliest pioneers and cowboys to the many blacks who lost their homes in the Vanport flood. The Albina Mural Project may be long gone, but hearing the unrehearsed remarks of these three friends, reunited here for the first time in 20 years, brings the idealistic visions of their youth poignantly back to life. This is History Pub. 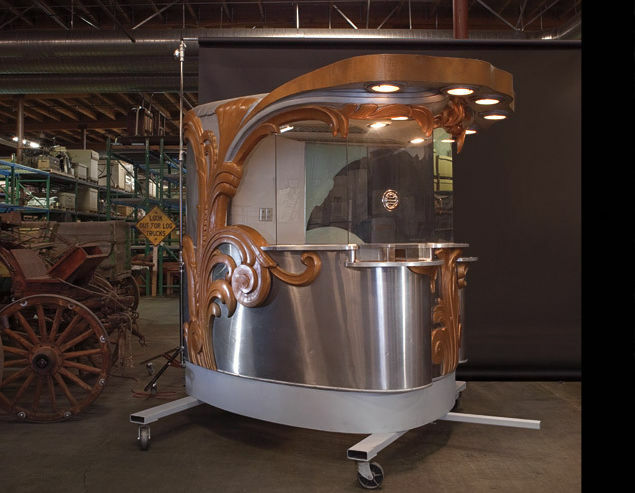 In the summer of 2008, Karen Kinzey of the Holy Names Heritage Center, the Lake Oswego branch of the national Catholic women’s group, approached OHS and McMenamins about fusing free historical discussions with beer, emulating the Oregon Museum of Science and Industry’s popular Science Pub nights. Nearly three years later, the program is an unqualified success: on the last Monday of every month, up to 400 people show up to tipple and learn the history of everything from homosexuality in the Northwest to the landmark brewpub legislation of the 1980s. Hunger for such Oregon stories is growing. The Dill Pickle Club, a two-year-old nonprofit, has led historical tours of Portland’s Chinatown and taken groups out to logging and timber sites. It recently began publishing the popular (and engaging) Oregon History Comics series, tapping a rich artery of often-little-known stories like the Vanport Flood, the Portland alt-music breeding ground the X-Ray Café, and the death of certain Portland highways—all on a budget of $30,000. Bosco-Milligan, an architectural history organization founded 24 years ago with a cache of old house parts gathered by two collectors, has grown into a $300,000-per-year institution, serving an annual audience of 50,000 and housed in a $2 million historic building on SE Grand Avenue. And over the past 28 years, well before History Pub, the McMenamin brothers have built a veritable empire on mixing history with beer and food, festooning their collection of renovated landmarks with old photos and interpretive stories. The company even employs a full-time historian—that’s one more than OHS. A ticket booth from the 1908 Fox Theatre. 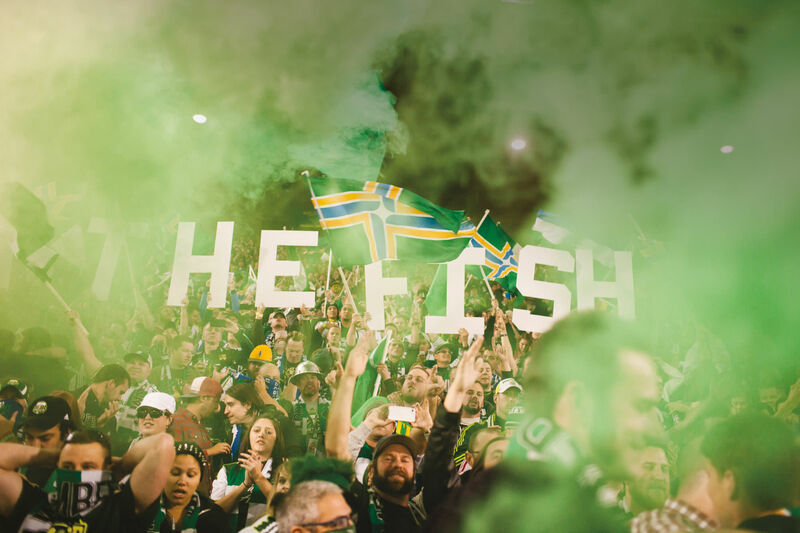 Over the same period that all of these efforts grew—much of it during the largest economic boom in decades, which fertilized major growth spurts for many a Portland cultural organization—OHS has slowly stumbled and often plummeted downhill. In many ways, the institution still lies in the long shadow cast by its first executive director, Tom Vaughan, who ran the society from 1954 to 1989. Vaughan’s motto was simple: “History can be sold,” he once confidently assured the Portland City Club. The trained historian and charismatic organizer and fundraiser walked his talk, securing an average $1 million a year (in 2010 dollars) in funding from the Legislature and building the 57,000-square-foot brutalist architectural landmark on the South Park Blocks that now serves as the society’s home. As the economic downturns in the 1970s and ’80s came and went, he imported blockbuster exhibits like the original Magna Carta, instituted an oral history program, and oversaw cutting-edge preservation efforts of its burgeoning historical film acquisitions. Shoes that big are hard to fill. Vaughan’s retirement in 1989 prompted a series of weak attempts: historians like Bill Tramposch from Williamsburg, Virginia, who clashed with staff and board; former Oregon Secretary of State Norma Paulus, who facilitated a major renovation of the Park Blocks building but failed to fill it with people; and, most recently, Vogt, who arrived from Delaware’s Hagley Museum and Library just in time for the Great Recession. 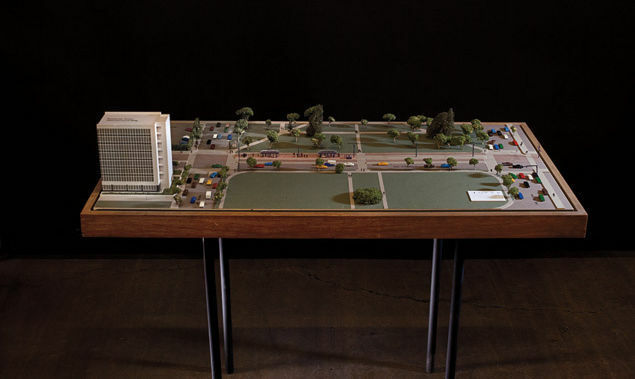 This architectural model from 1982 shows a segment of the MAX light-rail line in the Lloyd District. But beyond the attrition in programs for dedicated historians, OHS’s connection to its audience frayed. Public school visits dropped off. Membership declined by 50 percent. A much-hyped Lewis & Clark exhibit successfully leveraged a $3 million expansion of the building’s entrance pavilion in 2003 but lured only anemic attendance. Oregon’s sesquicentennial in 2009 likewise passed with hardly a raised eyebrow. As annual attendance dropped to just 43,703 last year, the specter of the 2015 due date for the society’s $2.6 million mortgage on the Gresham warehouse has loomed ever larger. The treasures hidden in the Vault seemed to transform from assets to liabilities. “They have a moribund facility,” says Matt Love, author of popular Oregon history books on subjects like Vortex I rock festival and the Trail Blazers. “How many courtyards are there in Portland that are uninhabited? OHS has the only one. And it’s dead." The final blow came in 2009 when, after a brief increase in funding, the Legislature slashed its annual contribution from $663,000 to $312,000. Vogt laid off a third of the already skeletal staff and that March announced the closing of the research library. Local historians howled and mounted both a Facebook campaign (“Save the Oregon Historical Society Research Library & Staff!”) and a protest outside OHS’s doors attended by, among others, Tom Vaughan, then age 85. The dire situation, and the ruckus, inspired the board to launch a Hail Mary pass—a tax levy—asking Multnomah County’s voters to approve 5 cents for every $1,000 of property value to bankroll OHS with a total of $10 million in funds over the next five years—about half of the society’s $4 million annual operating budget. With Vogt out in front threatening that a “no” vote would trigger a phased shutdown—and savvy campaign manager Liz Kaufman orchestrating speaking engagements, TV ads, and a trio of direct mailings to the 185,000 most likely “yes” voters—the levy passed with 54 percent. 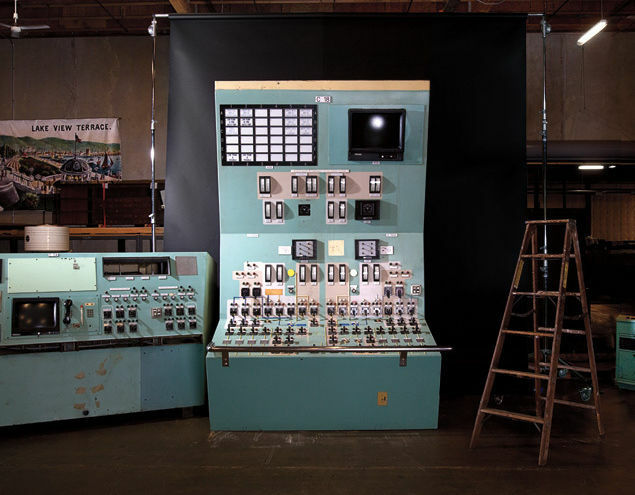 A control panel salvaged from the Trojan power plant. WHETHER THE infusion of public money will fertilize OHS’s rebirth or merely delay its death is now largely up to incoming board president Hudson and interim executive director Tymchuk. Hudson holds a PhD in American History from Tulane University. As president of Willamette University from the 1980s until 1997, he saved the school from financial implosion, growing the small student body by 30 percent and overseeing an expansion of its endowment from $34 million to $141 million. He joined OHS’s board in 2007 after stepping down as head of the Collins Foundation, one of the state’s four largest charitable foundations, and a perennial backer of OHS. With experience as neither a historian nor an executive director, Tymchuk, 52, is a less intuitive choice (a fact Hudson openly acknowledges by emphasizing Tymchuk’s “interim” appointment). What he does bring is a fat Rolodex. 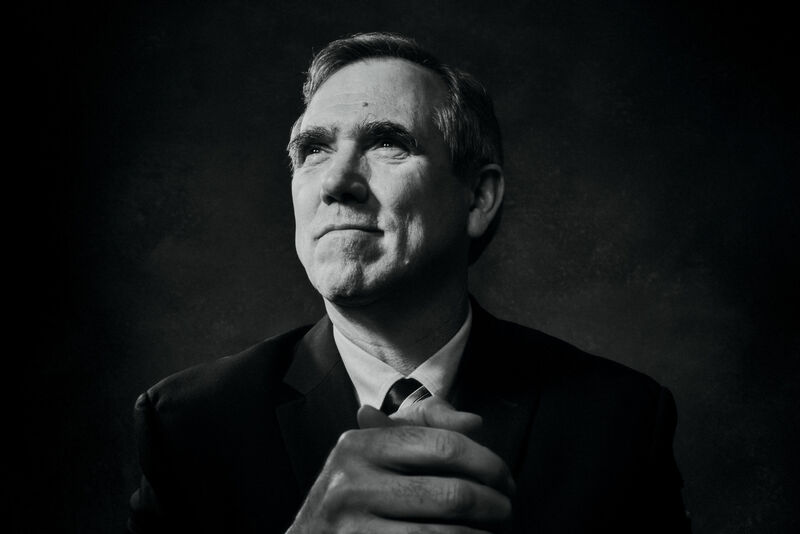 During a 30-year career in which he became Oregon’s consummate political insider, he served variously as legal counsel, press secretary, speechwriter, and chief of staff for a range of Republican politicians: Oregon Congressman Denny Smith, Bob and Elizabeth Dole, and Senator Gordon Smith. Most recently, he helped orchestrate Chris Dudley’s near-upset of John Kitzhaber for governor. Tymchuk’s first exhibit? A history of Oregon’s great legislative moments—a series of window panels covering the passage of significant laws like the 1967 Beach Access bill and 1994’s Death with Dignity Act—held in the Capitol Building in Salem. 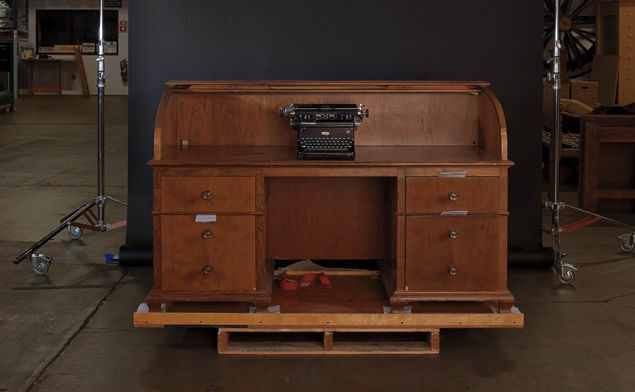 The desk and typewriter that Tom McCall used during his two terms as governor from 1967-75. Thinking smaller might be the key. Northwest Portland’s Oregon Jewish Museum, for instance, has thrived without steady funding, without a curator, and without legislative support. Running on a full-time staff of two, along with four part-time employees and a dedicated army of volunteers, OJM has grown cautiously but consistently for the past two decades, starting in the late 1980s as “museum without walls” with exhibits mounted in libraries and galleries. By December 2009, at the height of the recession, it had enough momentum to move into a newly renovated, 6,900-square-foot converted film screening studio on NW Kearney Street—complete with a 50-person auditorium, research library, and bright exhibition floor. The Oregon Nikkei Legacy Center has charted a similar path. Founded in 1989 as a Japanese heritage organization without a physical space, it has spent the last two decades accumulating manuscripts, photographs, and oral histories and producing events. It now has a staff of three part-time employees, including a curator, and an exhibition space on NW Second Avenue in former Japantown. Elsewhere, larger history museums have survived and even thrived, in spite of the recession. The Colorado Historical Society (recently rebranded as “History Colorado”) will open a new $111 million building next year, thanks not only to prudent expansion but also to an aggressive public programming effort, including last year’s installation at Denver International Airport, which stretched between two concourses and was seen by more than a million travelers. Although Montana’s historical society absorbed budget cuts of 5 percent, its entrepreneurial savvy has enabled it to maintain and even expand its programing, from publishing the 10,000-circulation Montana: The Magazine of Western History to inventing a curriculum to teach other local museums how to curate and display American Indian artifacts. The trick in each case, large and small, has been meaningful programming and collecting, but most of all it’s been synergy—finding, collaborating, and cross-fertilizing with audiences, whether by appealing to ethnic niches looking to understand their cultural past, by bringing history to the idling masses in a major hub airport, or by connecting with other nonhistory audiences. Wagons like this were used in the 19th and early 20th centuries to transport corpses from the place of death to the embalming table. One of OJM’s recent exhibits, for instance, a celebration of the life and work of Swiss-born Oregon composer Ernest Bloch, brought the popular Third Angle Ensemble to its auditorium for three sold-out shows of Bloch’s compositions. History Pub, in fact, offers the best start. It currently is OHS’s most popular program, yet one it didn’t start and that costs the institution nothing. Imagine infusing that same small-scale, inventive, and deeply focused—but free-form—spirit into everything it does, telling the history behind Portland’s chart-topping bands or its internationally renowned food scene. A Salem Landmark Legislation exhibit is a perfectly fine way to celebrate Oregon (even if a rather obvious stroking of lawmakers controlling the fate of OHS’s budget). But inside the Oregon vault hide many objects and stories that could reenergize OHS’s wider audience: the Banfield Expressway that transformed the face of Northeast Portland forever; the horse-drawn hearse as a window onto how Oregonians have dealt with death and dying; the Trojan nuclear plant that not only came within a pipe-leak of catastrophic failure but launched a thousand careers in political and environmental activism. 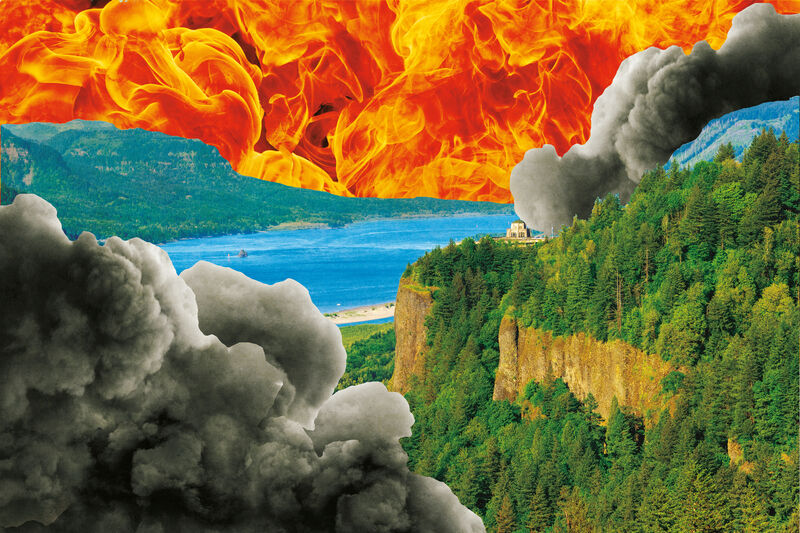 “Oregon’s always done things differently,” says author Love.